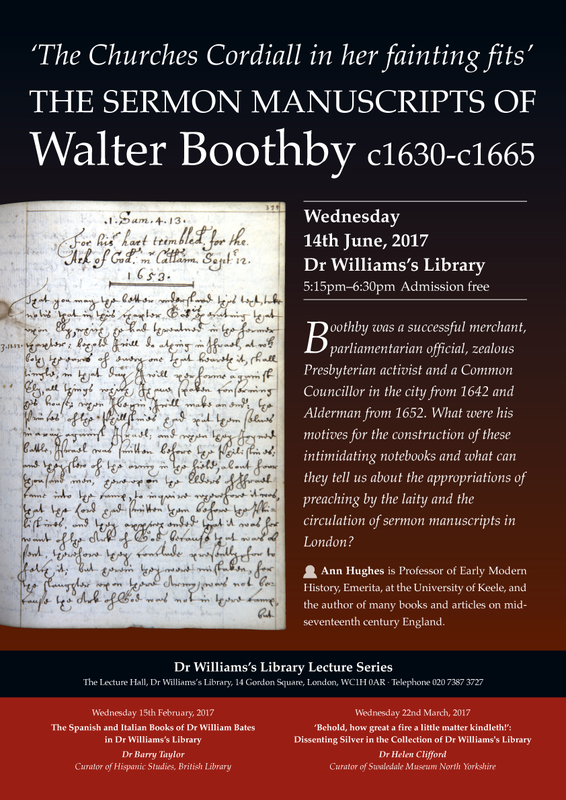 Dr Williams's Library | Event: 'The Churches Cordiall in her fainting fits': the sermon manuscripts of Walter Boothby c1630-c1665. 'The Churches Cordiall in her fainting fits': the sermon manuscripts of Walter Boothby c1630-c1665. My title is taken from the one that Walter Boothby gave to a volume of more than 700 pages in which he copied out extensive notes of sermons delivered by eminent London Presbyterians between April 1661 and late June 1662, interspersed with similarly lengthy accounts of sermons delivered on a variety of occasions between 1642 and 1653. Boothby was a successful merchant, a parliamentarian official, and a zealous Presbyterian activist, a Common Councillor in the city from 1642 and Alderman from 1652. The summary online catalogue of the Congregational Library does not identify Boothby as the compiler of this volume but he is already known for an even larger book based on sermon notes in the Bodleian, a folio of more than a thousand pages covering the 1630s to the 1660s. Boothby was a leading parishioner in the Puritan stronghold of Mary Aldermanbury and the bulk of his notes were taken from the preaching of successive incumbents of this living, John Stoughton and Edmund Calamy. Boothby's volumes are obviously useful sources for the preaching of Stoughton and Calamy but, inspired by recent scholarship stressing the importance of sermon reception, the focus of this paper will be on the scribal practices of the lay compiler rather than on the preachers. What were Boothby's motives and methods for the construction of these intimidating notebooks? What can they tell us about the appropriations of preaching by the laity and the circulation of sermon manuscripts in London? Most broadly the paper will use the notebooks to discuss lay Presbyterian involvement in religious and political change between the 1630s and the early 1660s. Ann Hughes is Professor of Early Modern History, Emerita, at the University of Keele, and the author of many books and articles on mid-seventeenth century England. She is particularly interested in religious and political conflict, print culture and gender. Her most recent book is Gender and the English Revolution (2011) but most relevant to this paper is Gangraena and the Struggle for the English Revolution (2004).